I am not a big cereal fan at all, never really have been, however if there is one thing I do like and seem to crave every now and again- its Granola! Of-course the normal every day granola you see is not suitable due to the high sugar content. So, I have spent some time playing around with different recipes and methods and finally have cracked it. There seems to be quite a few recipes online protesting to be healthy variations of granola, but they still are laden with sugar- honey and maple syrup are better than using refined sugars but are still sugar! This recipe doesn’t contain any sugar at all, the only sugar content will come from any added sweetness you choose to use i.e. from fresh or dried fruit. If you do opt for adding dried fruit do be careful of the sweetened dried variety, try to go for the unsweetened. I have only used fresh berries and it was just perfect. Now don’t expect the granola to be so sweet like the kind you would buy from the supermarket- just letting you know now..it doesn’t contain the sugar so it won’t! BUT what it does have is that amazing crunch, that normally would only be obtained from using honey, maple syrup or sugar- but instead I have used egg whites! The whisked egg whites creates the golden crisp and also increases its nutrient value by boosting the protein content. Apologies to those following a vegan diet or who are allergic to eggs, this one isn’t for you, although I did try using another recipe without eggs, but still not mastered that yet as it just didn’t come out right- I will keep trying though and let you know when I eventually nail it. The hemp seeds I used were whole, and can be quite chewy and difficult to get your nashers into- I chose to add the hemp also for its nutrient content with regards to fibre and protein, hemp is something I have started to use quite a bit in my cooking as it has so many health benefits- including improved digestion due to its high fibre content. The nuts I have used are not a must, you can use any that you prefer as most will work great. FOLD THE EGG WHITES IN WITH THE OTHER INGREDIENTS- GIVE IT A GOOD STIR MAKING SURE ALL THE INGREDIENTS ARE FULLY COVERED. BAKE IN THE OVEN FOR 50-60 MINS GIVING IT A STIR EVERY 15 MINS (SET A TIMER TO REMIND YOU)TO BREAK UP THE INGREDIENTS AND ENSURE EVENLY COOKING. 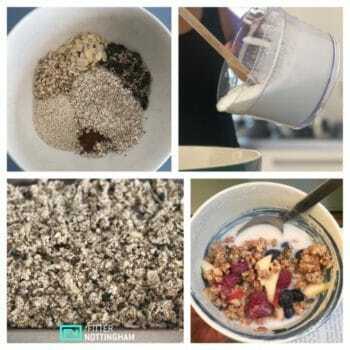 THE GRANOLA SHOULD BE A GOLDEN COLOUR AND NOT OVERCOOKED SO MAKE SURE TO KEEP AN EYE ON IT.